‘WHIRLWIND’ storms in as the first ever Death Metal band in Sri Lanka. The band stands out as a unique and dynamic metal band in the industry of metal music, by being featured in various metal websites around the globe carrying Sri Lanka into the world map of metal music. Whirlwind was established in 1995 as a six piece Metal Band pursuing a path of originality in Sri Lanka. Whirlwind has also developed its own unique style of music, which is influenced by Black / Death / Melodic and Doom styles of metal music that the band steadfastly pursues. The band has participated in many live shows which have earned them a big name in the Sri Lankan western music industry. Being the SLO (Sri Lankan Original) Award winning band, it has gained recognition in countries such as India, Singapore, Australia, Germany, Austria & UK as a leading metal band for its technically advanced type of music. The band follows a path of true originality. Whirlwind began its journey at a time when the industry never existed in Sri Lanka, at a time, rock / metal music was unknown in the country. WHIRLWIND was formed to establish an unorthodox industry, setting aside the typical boundaries, breaking its force, and managed to break through to build a new era of revolutionized music in Sri Lanka. Being unique in their own way of thinking and performing, having the ambition to follow the path of originality, the band introduced new topics unfamiliar to the local music Scene. In the year 1997 the fist ever Sri metal band came to life while facing many obstacles and went on to become the first ever band to create original Sri Lankan Metal music for the mass market. Having Performed at regular gigs at Colombo’s hottest night clubs, the band has built a huge fan base and has earned a large following among the young and the old. 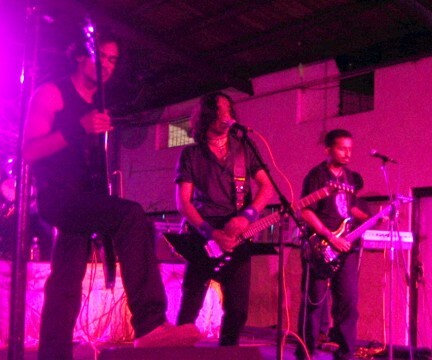 The year 2000 was the turning point for Whirlwind and its unique style of music, when the SLBC (Sri Lanka Broadcasting Corporation) English service recognized the band as the first ever original Rock / Metal band in the country. Given the privilege to record their originals in the SLBC studios the band started recording their first original named ‘Whirlwind in my head’ under their first producer Mr. Harold Fernando of the SLBC English Service. The first original was released on air through the ‘Saturday Club’ music program on SLBC English Service. In the year 2003 the band released its debut album called ‘PAIN’ under the famous Sri Lankan record label ‘TORANA’. Selling 20,000 copies within one year its fan base increased tremendously. The album was a sell-out in Australia, Germany, India, and Singapore while their originals were aired on various live and online based radio stations, as they gained international recognition. The album enabled them to be featured under various metal websites around the globe such as www.rsjonline.com, www.playersparadise.net. 	Releasing the first ever original Sinhalese Rock Album – ‘Pain’’ - in the Sri Lankan western music industry. 	Sold over 20,000 copies within a year of its release in 2003. 	Being the first ever ‘Sri Metal’ Band in the world by including 3 ‘Sri Metal’ tracks into their debut album ‘Pain’. 	Releasing the first ever metal/rock video in the country – ‘Mindbender’. 	Whirlwind songs are being aired in over 10 countries. ‘Mindbender’ is a hit song on the ‘SL Hot Ten’ chart aired by the TNL Radio Network as well as the ‘Saturday Club’ chart aired by the SLBC English Service. 	Being awarded under the special category for being the pioneers of Rock / Metal music at the first ever original music awards in the country - the SLO (Sri Lankan Original) Awards 2005.